No biggy, just a quick little blog post today I told myself. My Ten Biggest Lessons Learnt Ever, that’s nice and easy right? So clearly I’m mad but this is a post I’ve wanted to do for ages and hope will be a fun little exercise for myself if nothing else at least. I find it so interesting and inspiring to hear about other independent businesses’ stories and downfalls so hopefully this may help a few fledgling businesses out there by learning from my mistakes! 1. DON’T BE AFRAID TO REACH OUT TO OTHERS. Be it for help, advice, moral support or just drinking partners even! Since joining forces with the Bristol Girl Bosses group (read more about us here) I have felt so much more motivated, supported and positive about my business and honestly I think I’m probably just happier in life for having more friends around me. If you’re like me and perhaps pride yourself a little too much in being independent and self-driven, never under estimate the value of a creative network. Honestly. Seriously. This was quite possibly my lesson number one and I learnt it the hard way. Without any real-life business experience it’s all too easy to believe that as soon as you offer something to buy to the general public that it will just effortlessly sell itself. When putting it like that, it sounds pretty stupid actually, but I went ahead and produced way way too much stock (and not cheap stock either) right at the start without really knowing how well it would sell. Now I make a very small run of every new product type to test the waters first. Take baby steps and see where the path takes you. Something I think a lot of independent makers and businesses are all too shy of admitting and I have to say I still struggle to admit too. When you enjoy what you do and making your business work is your passion then it is hard to get away from that mindset of ‘oh but I don’t mind spending time doing that because I enjoy it’. There are of course exceptions, and when you’re starting out doing everything yourself is a good way to keep costs down. BUT if there’s a menial task you’re spending hours over such as hand-making something that doesn’t have to be, or packaging cards for example, consider whether that time could be better spent on something that will actually create more revenue for your business and if that revenue would outweigh the cost of outsourcing said jobs? I was kicking myself when I discovered Photoshop has an automate function and I’d been wasting ages on manually re-sizing and saving all my image files! I’m realising now these are beginning to sound quite obvious but I suppose there’s a reason for that, being that they are all very easy traps to fall into. I reckon just about every designer-maker out there has done this. We all think to ourselves ‘oh but no-one will want to spend that much on my work.’ Well shut up because you’re wrong and they will! If your work is original and different from anyone else’s and you spent time and care creating it then that has a huge value! I often end up discussing with the Bristol Girl Bosses group how easy it is to forget that: you are not your customer. Someone quite different from you is, who quite possibly can only dream of having the skills you do and also quite possibly has a much larger income than you as well. The Design Trust has some really great articles on pricing your work. I recently listened to a new podcast called Failure By Design and I love the concept of that title in itself. The host introduced the first episode explaining how failures are branded as such a bad thing that we feel shameful of and hide, but it shouldn’t have to be that way. In failing, you were brave enough to take a leap knowing full well that you may fall and that’s surely something to be proud of! Ok, I’m not saying anyone’s happy about it when they fail, but there is always, always a lesson – or lessons – to be learnt from failure. I mean that’s kind of the whole essence of this post, and I tend to find if I learn something from failure, I learn that thing well. So following on from point 5, when you do fail the important thing is you pick yourself back up again. Not everyone is resilient enough, but chances are if you made the choice to run your own business, you probably are! There have been maybe two or three occasions when I can remember really contemplating what the hell I was doing with my life and if I should just throw in the towel or start a second ‘supplementary’ career path (crazy I know)… and I’m so glad I didn’t! If you need to step away to re-assess then by all means do, but stay focussed and remember why you started this journey. Think about what is working and go from there. I personally think giving up is harder than giving in, but that’s probably because I’m so stubborn! Back in January a mentioned a book called Your Best Year Planner by Lisa Jacobs in my blog post HOW TO… Be a Go-Getter. This book has given me so so much and, as I explain in more depth in the post, a really key thing I’ve learnt from it is to write down my goals and to keep going back to them, checking if I’m making progress towards them and reviewing each month to check in with myself. Measuring my goals, writing plans down and creating habits have all been such major game changers for my business since mid-2016 when I first got Jacobs’ book. I would highly recommend it! Ok, so not everyone is a big fitness fanatic or perhaps very able to move about, but then again I didn’t used to think I was. Even if it’s just taking 30 minutes out to go for a light walk I seriously cannot recommend the stress relief that exercise provides enough. For me it gets me awake and energised for the day, it takes my mind completely away from everything else going on in my life and I feel healthy for it too. Working from home used to make me feel really lethargic by the end of the day because half the time I’d barely use my legs all day but then when I realised all the other health benefits of sweating it out each morning I was hooked! 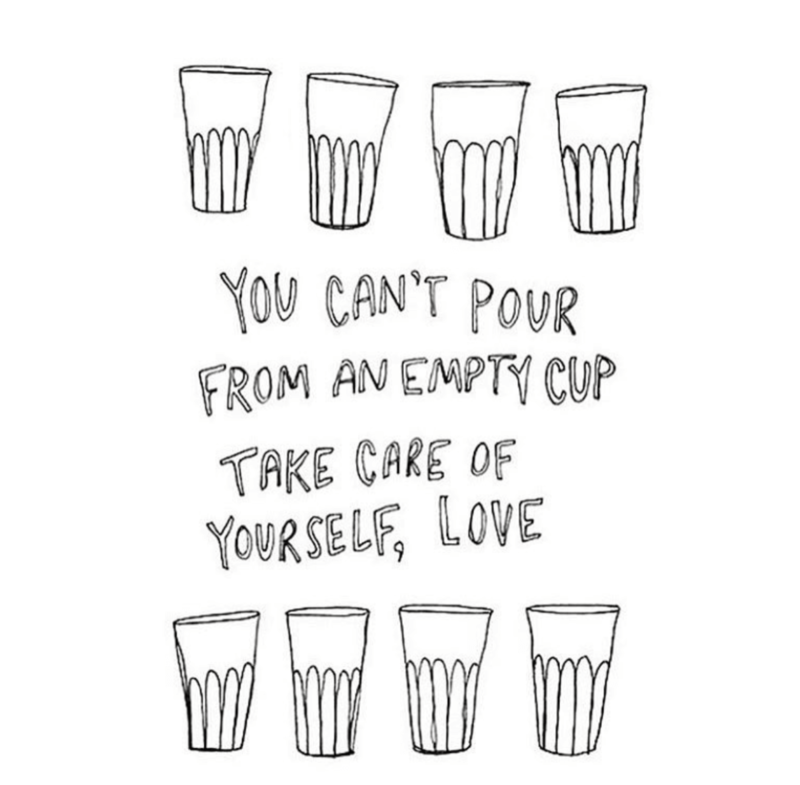 Today I saw this little motivational post on Instagram: ‘You can’t pour from an empty cup’. It really struck a chord with me because I am so guilty of this. It made me think about the contrast of how drained and de-motivated I felt on Tuesday following a couple of nights of limited sleep, and how much fresher and better I felt today following three nights of much better sleep. Things like sleep, and time off enjoying yourself with friends and family have more value than you know. I can be awful for never taking days off, or even the evening to relax, but make sure you do at least sometimes because you really can’t run on empty. As Einstein famously said ‘Insanity is doing the same thing over and over again and expecting different results.’ Lisa Jacobs uses this point in her planner mentioned in point 7 and it resonated with me. When I bought her planner in 2016 I was forced to be a lot more honest with myself and I had to basically face up that by Einstein’s standards I was insane. Somewhere down the line you are almost bound to need to make change, so be brave and be honest and ask yourself what is and what isn’t working. Do this each step of the way in fact because as I see it, a business is an ever evolving thing that can always be strengthened and improved. Ok. That felt like a good hour of intense self-reflection. Think I might do something creative now! I really hope this post is useful to a few people out there, I’ve certainly found it interesting to see just how much I have learnt. To start with I wasn’t sure if I could think of 10 things, but now I feel like I could go on and on!